No matter how expensive your digital SLR camera, it still gets invaded by dust. More to the point, dust finds its way onto the camera’s sensor, like it does on any other surface. Unfortunately, when a dust speck lands on the sensor, it will show up as an annoying spot on your images. So, how can you get rid of them? Read on! Creative photography should always include vertical compositions. However, the camera is designed for horizontal images, which mimic our eyes’ peripheral vision and horizontal point of view. So, how does a photographer go against tradition and create vertical compositions? I have three techniques that I use in the field to make it very easy. Read on to find out what they are! The advances made in digital photography are incredible, and in many ways make photography easier. For example, cameras have powerful tools that allow us to see what our image is going to look like even before we take the shot. That’s amazing! Sounds easy to get a good shot, right? Just make your adjustments until it looks right and then shoot! But is it really that easy? Not necessarily. Technology may be powerful but if the photographer is to make the best use of it, she must also have the knowledge to use it correctly, and understand its limitations so she can work around them. What is this technology I speak of and how do I use it? Read on! Exposure Compensation: The Camera is Not Always Right! What a difference that makes! So, why is the camera’s auto exposure so different from manual exposure? It’s quite simple. 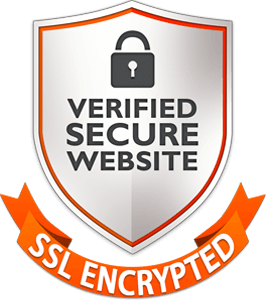 Read on and I will explain so that you too can get the correct exposure all the time. Who doesn’t love a reddish orange sunset or those dazzling pink feathers of the roseate spoonbill? Nature is brilliant with color, so it is no surprise that nature photographers try to capitalize on those eye-catching colors. The more saturated the color, the more eye-catching it is. Quite often, the photographer uses the logic that if a color grabs the viewer’s attention, then saturating that color during editing will grab more attention. And they would be correct, which is why so many photographers are enticed into applying saturation to the entire image. Sounds great, doesn’t it? To the contrary! Read if you are curious to know how I choose to apply saturation (or desaturation) to my images. I am sure you have seen many photos of water in which it looks unnaturally smooth or misty, such as the photo above. These photos are often placed in the category of “fine art” because they don’t look like a normal photograph. These images can be quite compelling and are often appealing for their calming nature and creative use of negative space. Ever wonder how a photographer gets the water to look like that in their photo? Read on and I will show you. There are so many ways that a photographer can adjust the camera to alter the appearance of a photograph, including exposure (amount of light) and focus point (sharpness). Another setting that can dramatically affect how a photograph looks is something called white balance. On modern digital cameras, there are several white balance settings for all kinds of lighting conditions. What happens when a photographer uses the wrong white balance setting for several shots? Read on and find out how forgetting to change a setting may actually create better results. You may think that perfect focus is a given with all the sophisticated auto-focus functions that come with the new cameras. Indeed, new photographers are seduced into using automatic settings for this very reason, but only to learn quickly the limitations of their camera. Perhaps one of the most critical ‘a-ha’ moments in wildlife photography is when we learn that almost always, we have to do things our way and not allow the camera to make the decisions for us. 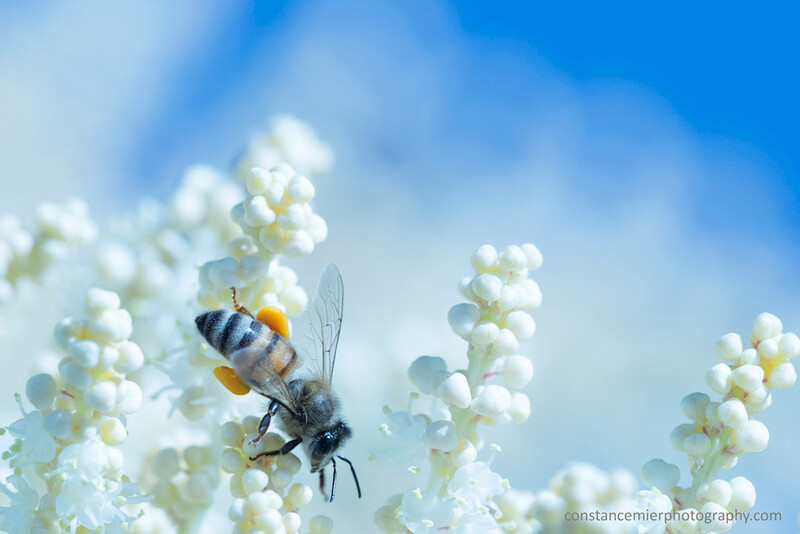 Case in point, honeybees pollinating a blooming ponytail palm. 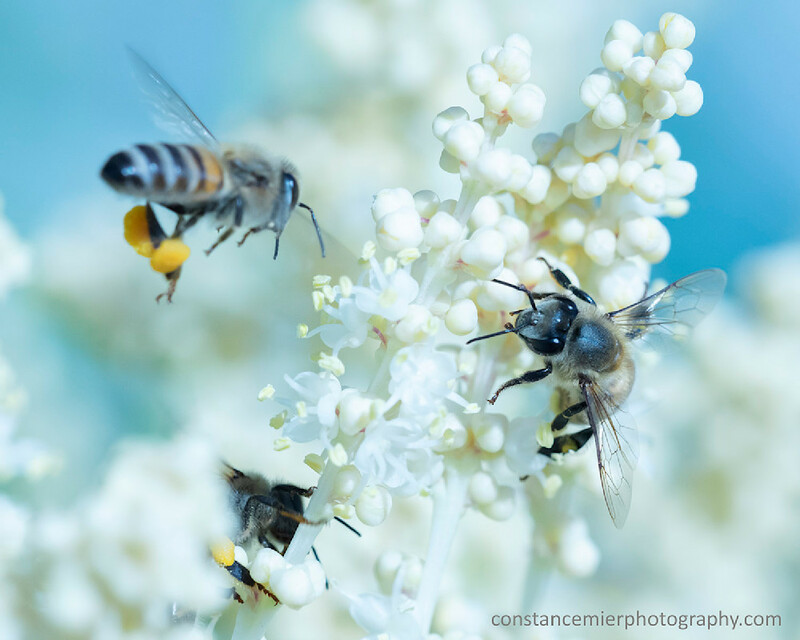 What do honeybees have to do with auto-focus? Read on! 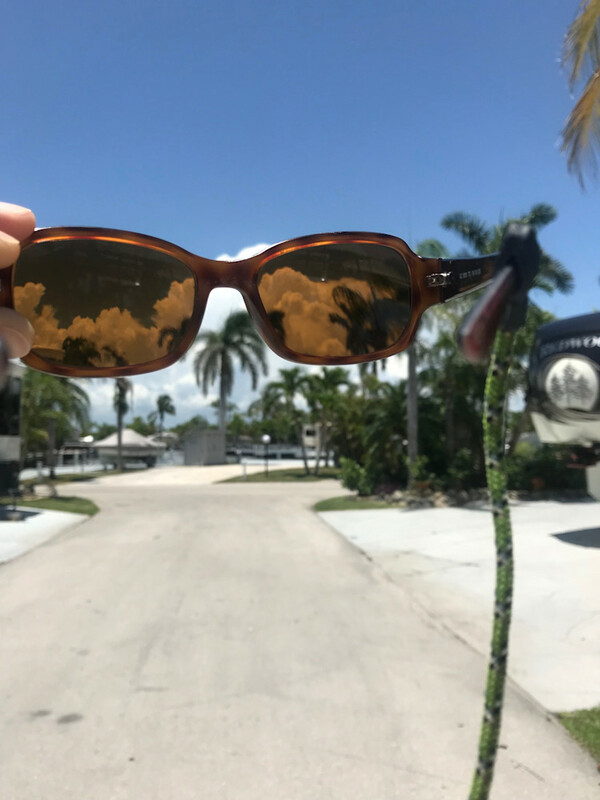 If you spend time on the water in a boat, chances are you wear polarized sunglasses. And for good reason; the polarizing effect cuts the glare on the water dramatically and allows you to see through the water (a great thing for fishermen!). Photographers also take advantage of this effect by using a polarizing filter that can be attached to a lens. 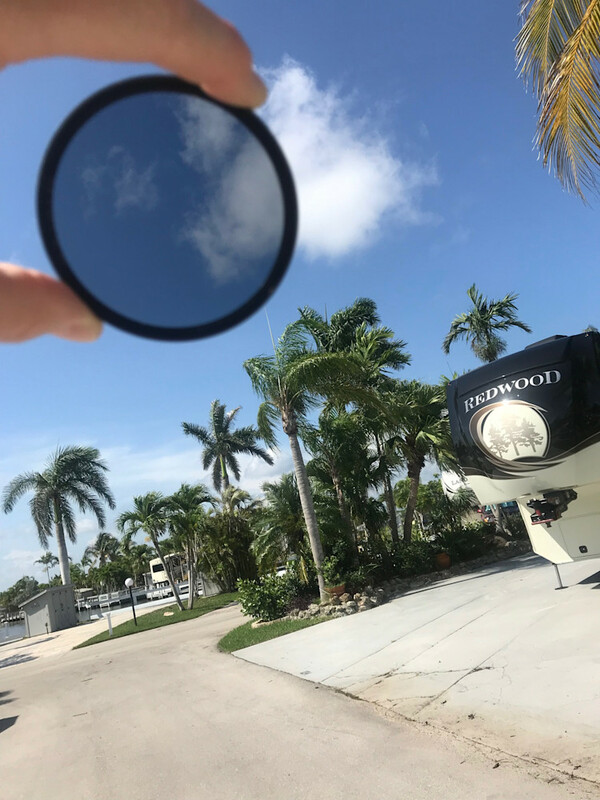 The photo below shows a circular polarizing filter and how it affects the sky. The effect on water is quite similar. So it should be no surprise that photography from a canoe relies on the polarizing filter quite often. But sometimes, I prefer the opposite. Sometimes I prefer glare on the water. Read on and learn how I decide on when to attach and when not to attach my polarizing filter. To me, there is nothing more magical than water movement gently disturbing the reflections and creating colorful patterns. 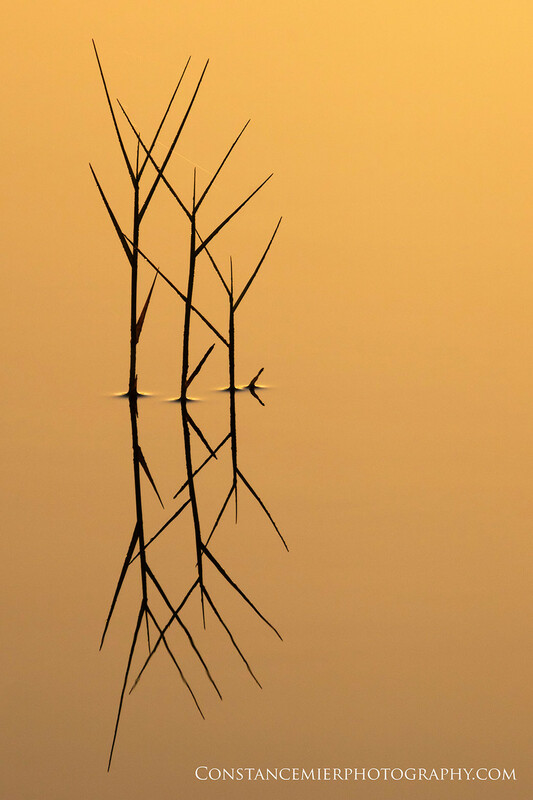 So it should be no surprise that I include water movement and reflections in many of my photographs. While water movement is created naturally from wind, tidal currents and even marine animals, I have learned to create water movement and incorporate it into several images. Want to learn how I do that? Read on! Everyone has seen waterscape images where the water looks silky smooth, many times appearing otherworldly. These can be breathtaking and appealing in so many ways and are dramatically different than the average snapshot that maintains the textures of the water movement. A long exposure shot will set the scene apart from the normal and add an artistic quality, when done well and with thought. So how do I go after those types of shots like the one above? Read on and learn one photographer's technique for capturing long exposure waterscapes. 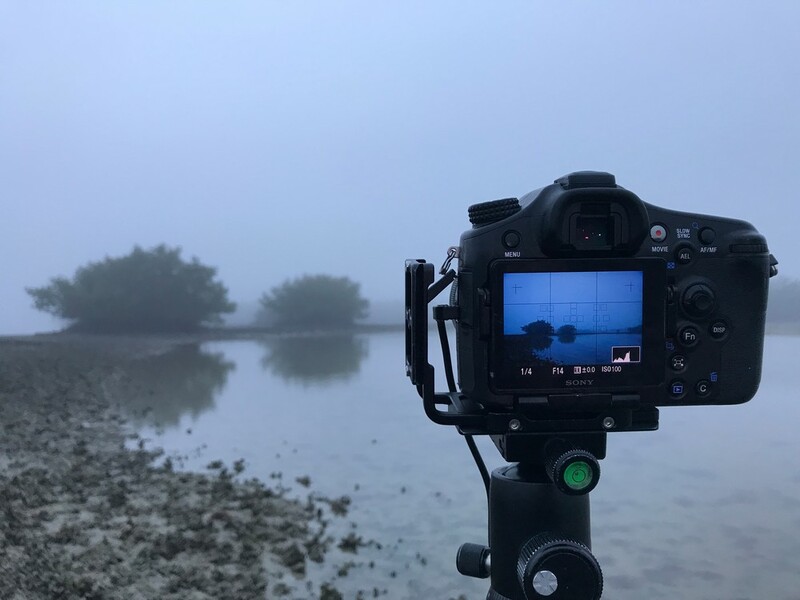 For the final "Processing an Image" series, we'll look at the image above that was shot in the Ten Thousand Islands National Wildlife Refuge. The bird was approximately 300-400 feet away from me and I had to use a 400mm lens to capture this scene. This image is actually a combination of two shots. And the "Orton" effect was applied. Curious? Read on! The photo above and others similar to it have evoked questions about their authenticity. 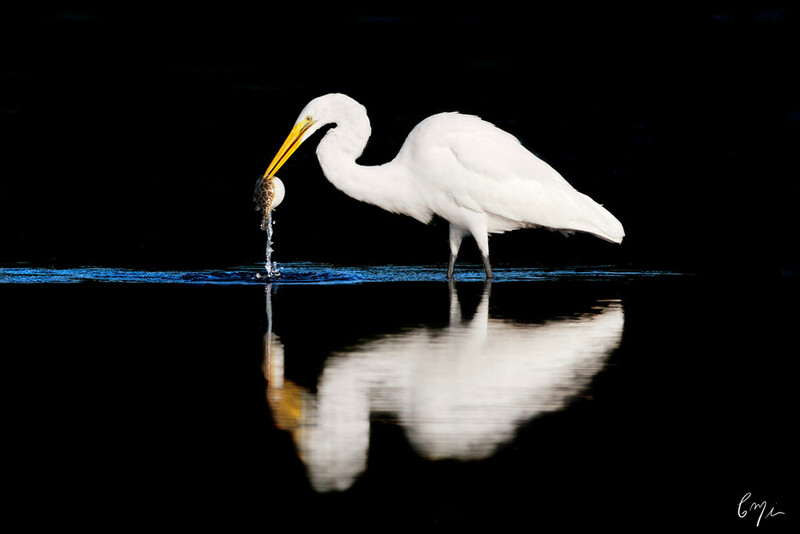 Continue reading and learn how I processed this image of a great white egret with a pufferfish in its mouth! In Part 1, I presented a straightforward process to transform a raw image file (out of the camera) into its final version. In this post, I’ll provide an example where the processing boundaries are stretched more to achieve my vision of a scene captured one early morning. Read on! This blog is the first of three (or possibly four) posts that are inspired by questions asked about my images. 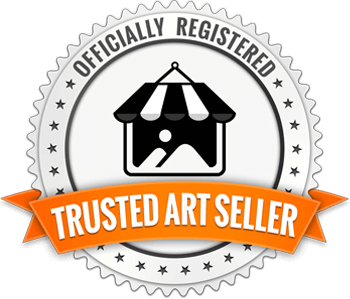 Most of these questions come from visitors to my art festival tent where I display several prints of various sizes and mediums. Most are printed on canvas because I really like the effect of the canvas texture on many of my images. And that is where the questions come in. 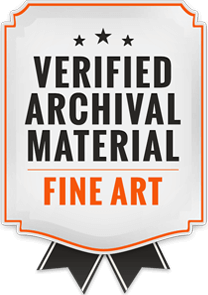 The most frequent one is "Is that a photograph?" Following my response "Yes", the next question is often this one, "But you paint on it, right?" This may go on for awhile and in fact, one visitor argued with me about it. She did not want to believe my print was a photograph and not a digital rendering or a painting! And then quite often the discussion turns to post-processing software, such as Lightroom and Photoshop. "You Photoshop it, right; because it really didn't look like that for real, did it?" So, I thought it might be of interest to some (both customers and photographers) to learn how I process a specific image and to see it in its original form. I'm going to begin with an easy one, titled "Playful" (see above). Playful was shot on Biscayne Bay at approximately 8:25 AM on February 9, 2015. For the photographers, the camera settings were f9, ISO 100, shutter speed 2 seconds. Neutral density filters were used with a 16-50mm lens and the scene was shot at 16mm. The raw version (the file right out of the camera) did not look so much like the final version. Want to see what it really looked like? Read on and learn how I transformed Playful from beginning to end. 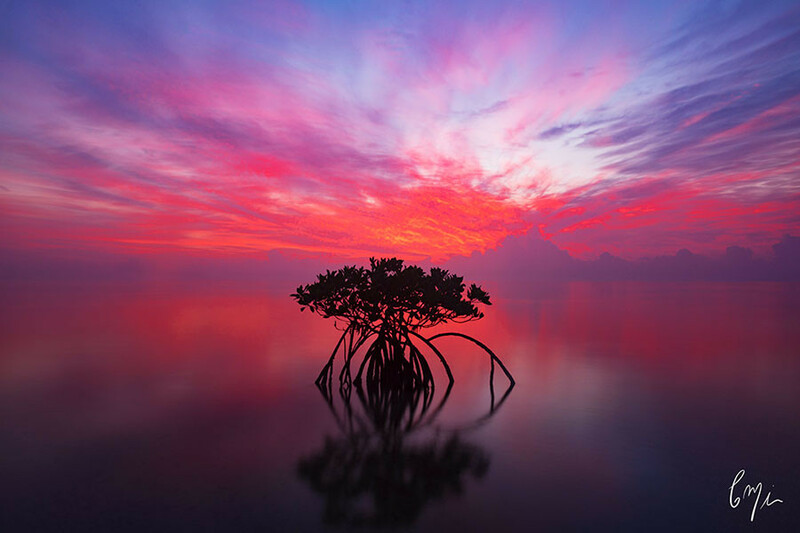 I love a lone mangrove tree. 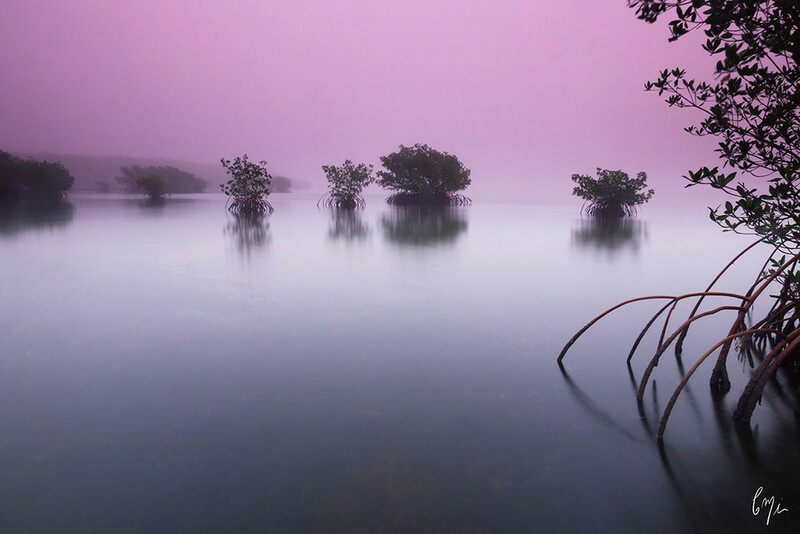 If you've seen any of my photographs, you have seen a lone mangrove shot, such as the one above. What I look for in those shots is an interesting sky to frame the tree. It should make sense that I would want to capture a wide expanse of sky and then place the tree somewhere in the middle. In order to do that, I use a wide angle lens. Wide angle lenses have very short focal lengths and wide angle of views relative to our normal view. This is appealing for photographs that include the sky or ocean; however, the other characteristic often overlooked is that all objects appear farther away than they really are. I think of it like a rubber band, everything in the photograph is stretched outward away from the eye. 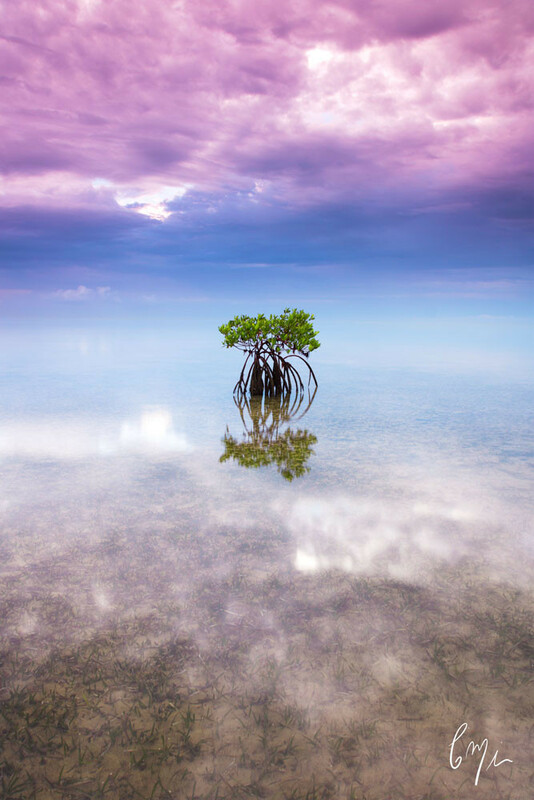 So if everything appears smaller, how can I make a small mangrove tree look prominent within the frame when using a wide angle lens? Read on! But sometimes, I don't take my own advice! A good example is my recent visit to Kirby Storter roadside park which has a boardwalk that meanders through a mature cypress strand (photo above). The strand is dense with trees and brush, and the recent hurricane really messed it up. Recently, it was full of birds. So, how do you walk into a scene like this one and expect to photograph a bird, such as the great white egret in the photo below? Read on to find out how I negotiated the clutter of a cypress forest in search of a bird photo. 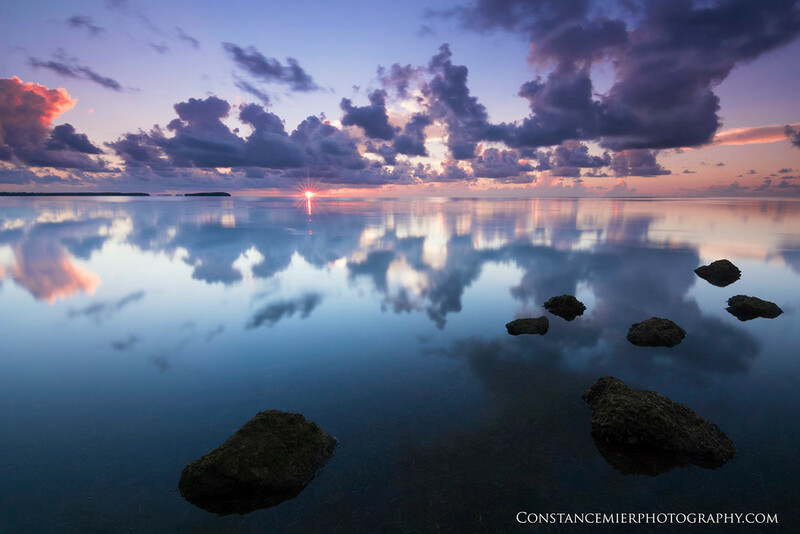 Here in south Florida, we have endless wide open spaces to capture great scenes with clouds and sunrises. 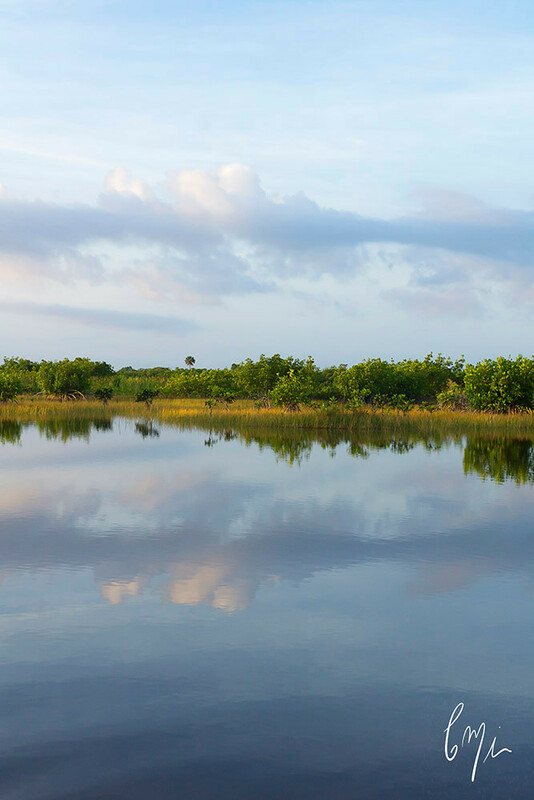 Beaches, mangrove shorelines, wetland prairies, cypress forests, you name it, Florida's got it. With camera, we go wide and get our shot. And then we go home, right? Wrong! After the sunrise shot, it is a perfect time to get to know your location better. This is when you begin to see more intimate scenes that you might otherwise miss if all you're after is a sunrise. Take the photo below for example. It was shot in the same location as seen in the photo above. So how can I go from shooting a sunrise to a more intimate scene? Read on! For over 12 years, I've driven the Tamiami Trail (Highway 41) that runs east & west between Naples and Miami several dozen times a year. It is a beautiful ride that passes through cypress swamps, pinelands and freshwater marshes. Typical to Florida, the scenes are often wide open prairies with a few trees standing way off in the distance. Below is one of those scenes, with a charming hardwood tree island 1000 feet or more away. The photos below were taken at a wide angle (16 mm) focal length and at 35 mm focal length, respectively. Both images are 'raw', meaning no editing performed. I should also note that both images were taken shortly after hurricane Irma. Compare these two raw images to the image at the top. What a difference! So how do I go from the two raw images to the one at the top? Read on please! When photographing wildlife, your position relative to the subject's can make a huge difference in the appearance of the image. Want to learn more? Read on! I have been blathering on and on about backgrounds lately, so I promise this will be the last blog on this topic. At least for awhile! To follow up my previous post about dynamic background, this one focuses on those images that work best with a static background, such as the image above. There are lots of ways to approach this, so read on to learn more! While strategies for photographing one animal may differ from another animal, a consideration that seems to be consistent in wildlife photography is background. 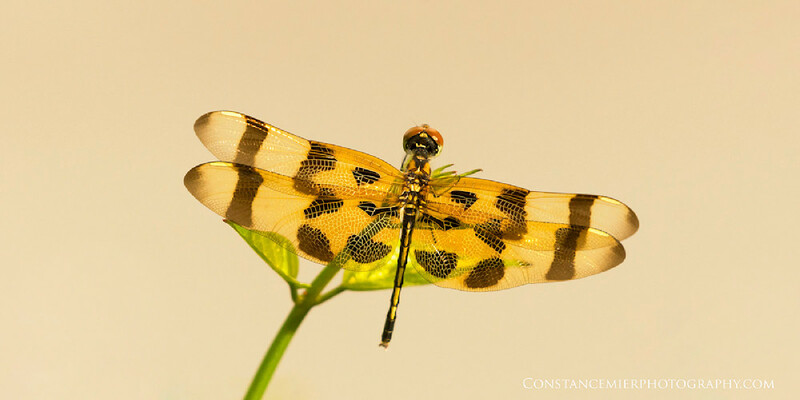 For this topic, I use butterflies and dragonflies as examples. Why? Well, background almost always involves foliage with these attractive subjects. This can be quite a challenge especially if the foliage is dense with shadows and highlights and various shapes and colors. But maybe, just maybe we can create a pleasing image that takes advantage of the busy backgound. Read on and learn how! 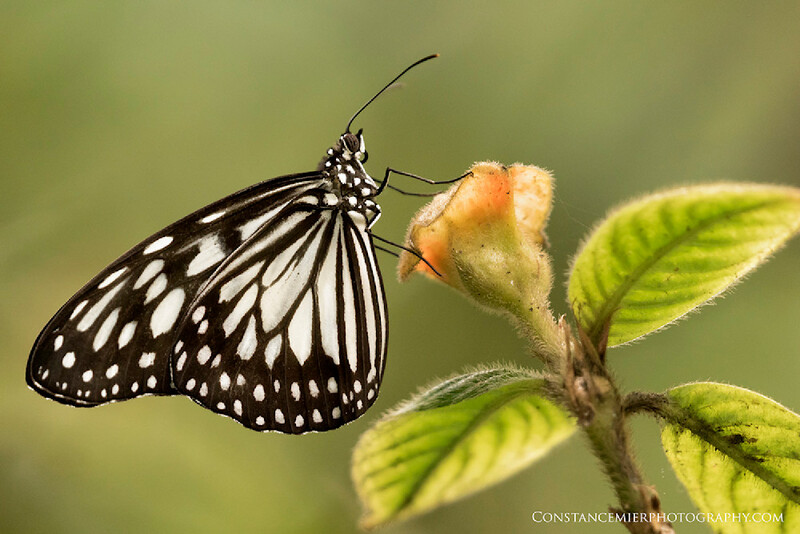 For its colorful wings, the butterfly is a popular subject and there are many locations to photograph these beautiful creatures. Living in Miami, I have access to a butterfly conservatory that I visit frequently during the summer months when I am not camping in the Everglades. The conservatory is a relatively small space crammed with dense foliage and the air is alive with hundreds of flitting butterflies. To say it is visual overload is an understatement! 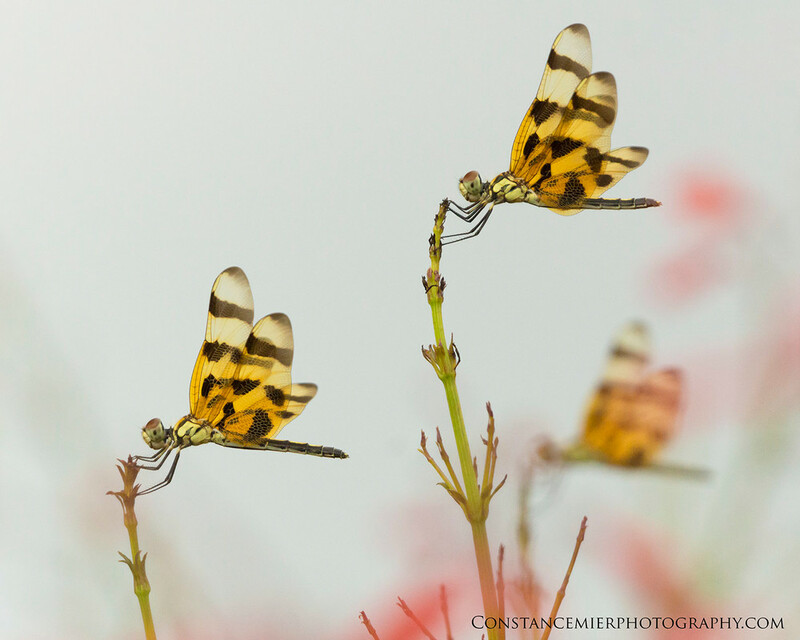 So how can a photographer make sense of the scene and capture an image of a butterfly? Read on! OOF = out-of-focus. Most often it is mentioned in reference to either A) background or what is behind the subject, or B), something in the foreground that partially covers the subject and really shouldn't be there (i.e., errant branch). OOF background is ideal most of the time as it allows the subject to stand out. But what about OOF foreground? Should we always try to avoid it? I say not and in fact, OOF foreground may add interest to a composition. Want to learn more about this creative technique? Read on! You couldn't ask for two birds more different from each other than the brown pelican and great white egret. 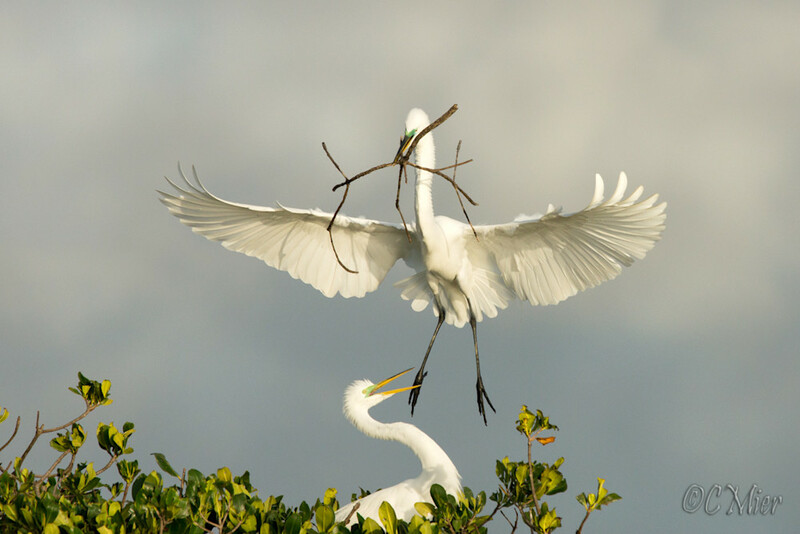 Yet each spring, the two species share a very crowded nesting location in the Everglades. I often paddle my canoe to the rookery, and from one spot, photograph both brown and white birds. Obtaining the correct exposure on those beautiful feathers is always a priority in bird photography. So how do I manage doing this when I have two very different birds? Read on and find out how to capture dark birds and white birds in one sitting. The wonderful thing about living in water-abundant Florida, wading birds are just about anywhere. Quite often, we find very accessible locations where there is an abundance of birds. Sometimes however, these locations make photographing very challenging because of the tight surroundings. So what do you do when you want to photograph birds in less than ideal places? Read on! 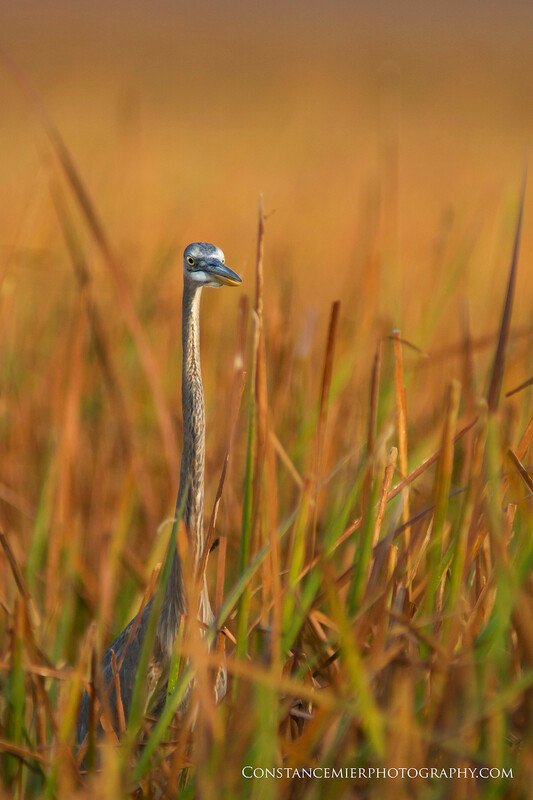 The Everglades is a winter home to many migrating birds. 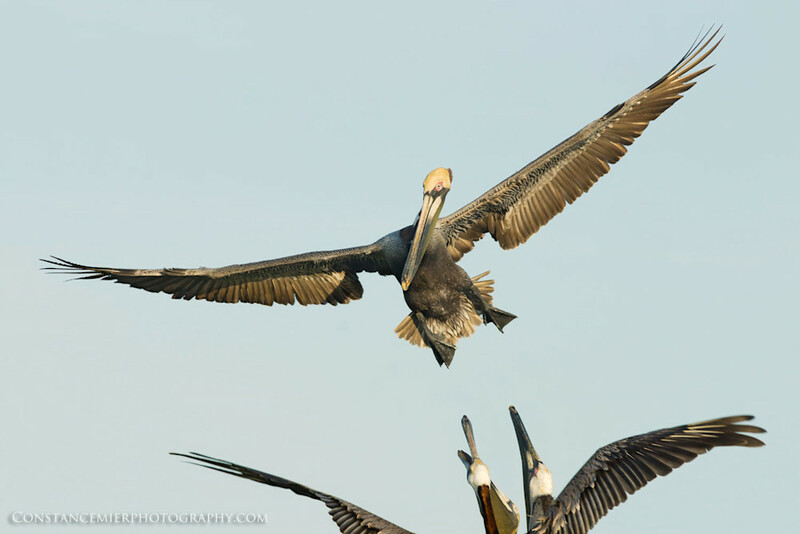 In the gulf waters, the most obvious one is the very large American white pelican. Most of the time, when you see one, you see several hundred. Rarely will you spot a white pelican gone solo. 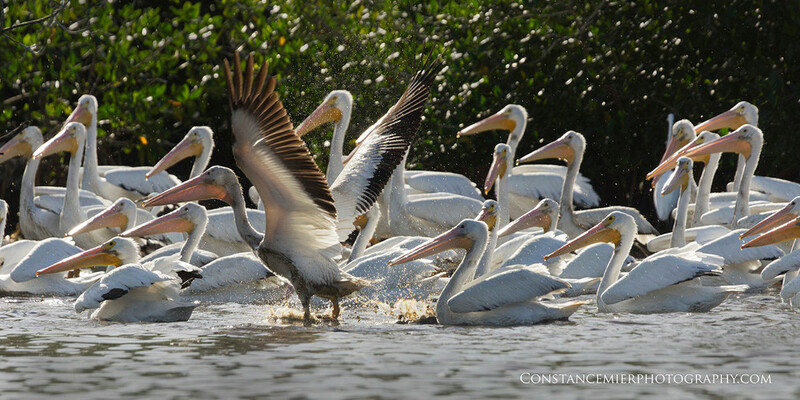 Almost always the case, when I photograph white pelicans, I am photographing a crowd of them huddled on a sand bar. Up close it is a spectacle of bright white and brilliant orange beaks and legs, which can be very challenging to capture well. So how do I photograph a crowd of large white birds? Read on! I frequently paddle my canoe deep into the backcountry Everglades, often requiring several miles of traveling in one day from one camp location to another. Sometimes, I am in my canoe from 7 am until 4 pm. 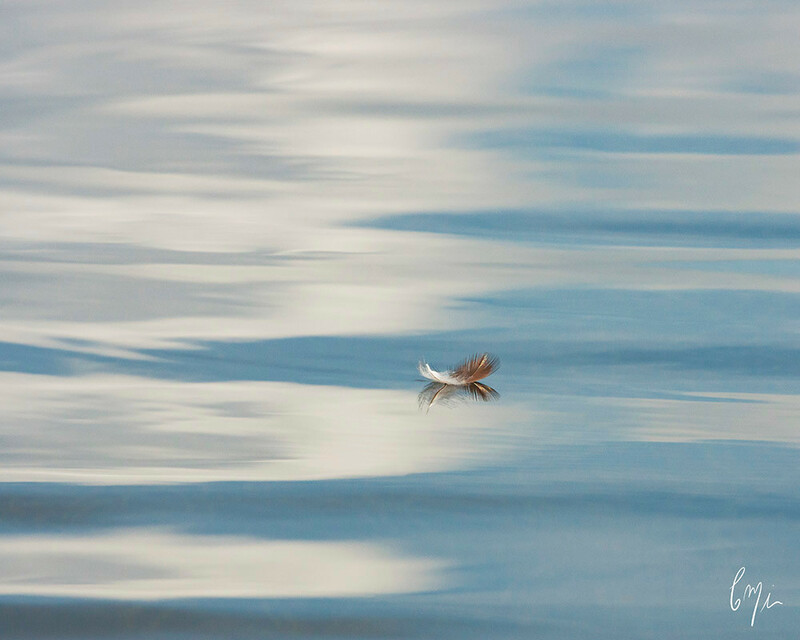 While paddling, one of my favorite experiences is coming upon birds wading in shallow waters, dive-bombing the water, roosting in trees or flying above. No matter how tired I feel from paddling, I never get tired of photographing the birds. So how do I manage to capture them while traveling by canoe and with less than ideal weather conditions? Read on! 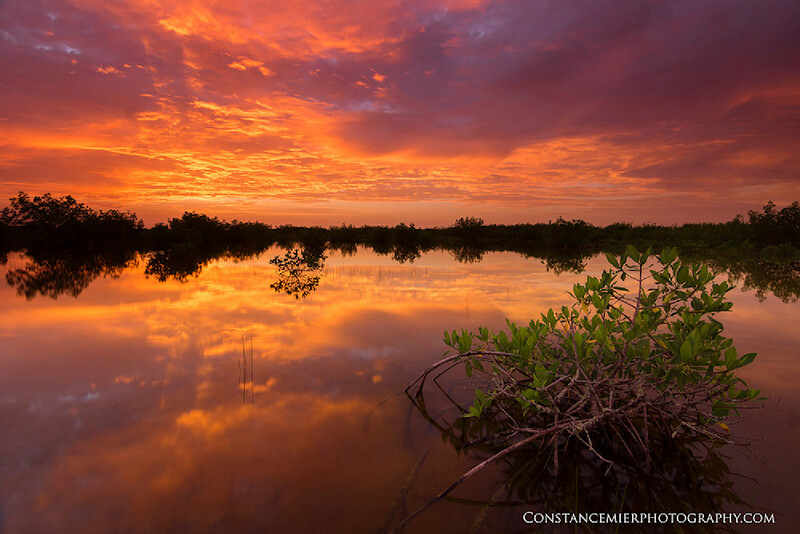 It is finally that time of year when I begin my camping trips in the Everglades. This is how my photography began. What began as merely a way to record my trips, eventually grew into a passion and my art. So how do I prepare for a photography/camping trip? Read on! 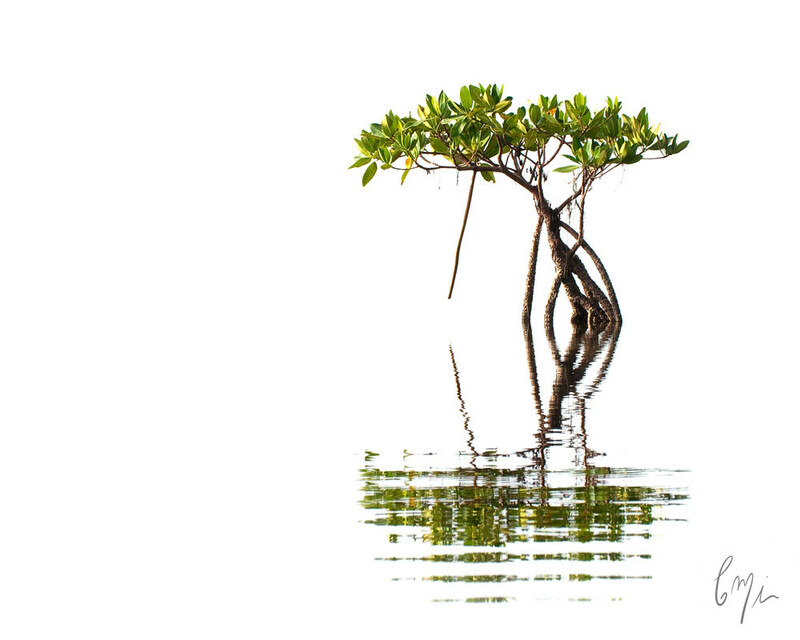 Lately, I have been focusing on abstract type images, mostly inspired by mangrove trees. Many of these are created using a blur effect. Want to know how I do that? Read on, please! Being in a canoe, I am naturally surrounded by water. Intrigued with how reflections are disturbed by the movement of the boat and paddle, I decided several years ago to incorporate this effect into my waterscape images. To do that, I use my canoe. How is this done? Read on! If you looked through my galleries, you may notice that many of my images are vertically composed. This is contrary to tradition, especially in waterscape or landscape photography. So why do I do it? Read on and find out! 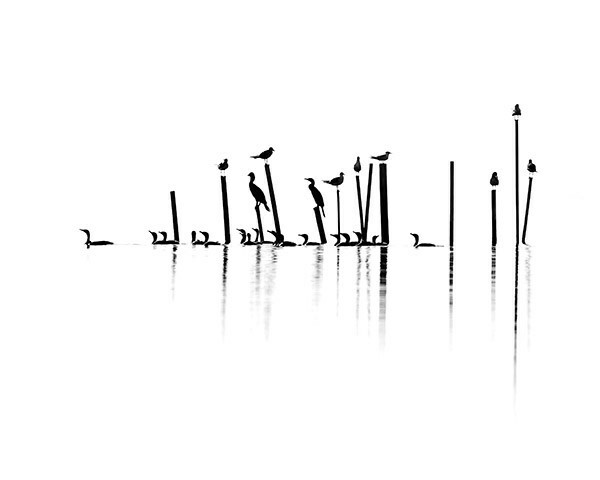 This image titled "Gulls & Cormorants 1" is one of my most popular ones and can be found in the gallery "silhouettes". I often get questions about how I got this shot and those similar to it. I always start by saying, "This was one of the easiest shots I ever got!". Want to know more? Read on!